Message boxes can be modified quite extensively to give you your user a much better experience. So before you set about creating a Form to use as a Messsage Box, consider using the more advanced features of a “Built In” Message Box. If you want assistance with the "Advanced Message Box" Please Post in this AWF thread - Click Here"
In this follow-up video from my first Advanced Message Box Video, I demonstrate the code working in The “Nifty Switchboard Builder”. I go through what’s happening demonstrating the code actually controlling events, and explain how it’s doing it. 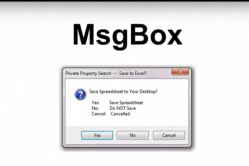 I have also provided a code example of the Message Box Code working in a sample database. Download the code by clicking on the link below. I wanted to delete a Menu Page in my “Nifty Switchboard Builder”. The Switchboard Builder helps you build a menu system for your MS Access database. It’s based on the original Microsoft switchboard builder, but I have added some extra features, and made it a lot easier to use! I needed to check that the user was sure that they were ready to delete a menu page and understood the implications. I also didn’t want them to be able to delete the “Main Menu” the “Master Menu Page” because this would cause all sorts of complications. I realise that the “Advanced Message Box Code” would just drop in and allow me to quickly and easily create a pop-up message box and help the user in making the correct decision. I also had two, different user cases to solve, one was calling the code from a button on the form and the other one was calling the code on a pop-up form, both common MS Access User Case scenarios. I recorded the generation of the code and my thoughts about my decisions in creating the code in the YouTube videos ABOVE which should help anyone who wants to undertake the same task in their own database. The code is available through the Sellfy digital download sales website, for the for a small fee. The code is also available for free in text format at the bottom of this web-page. I have recently updated the sample message box code (SEE BELOW) to reflect an actual real world example. It’s not quite the same as the code shown in Video 1 ABOVE. There are now THREE Videos Demoing the Advanced Message Box. I have also packaged the code shown in that video in a Sample Database which you can download by clicking on the download links above. It contains TWO working examples of the “Advanced Message Box Code” in use. The Code is based on the “Nifty Switchboard Builder”. The Switchboard Builder allows you to create a new Switchboard Page, the Switchboard Page will have a default name, however this Message Box offers the user the option to change the default name to something else, or to leave it as the default name and escape from the process without making any changes. Me.txtNewPageName = "Default New Page Name"
strMsg1 = "Do You Want Change Default Page Name, to Something Meaningful?" strYes = "  Yes:          Return to the Textbox. I will Create my own Name"
strNo = "  No:          Just Use the Default Please"
strCancel = "  Cancel:    It's Bloody Confusing, I'll Just Play it Safe for Now"
strTitle = conAppName & " --- Change Default Page Name?" MsgBox "Error From --- Select Case in btnGo_Click"